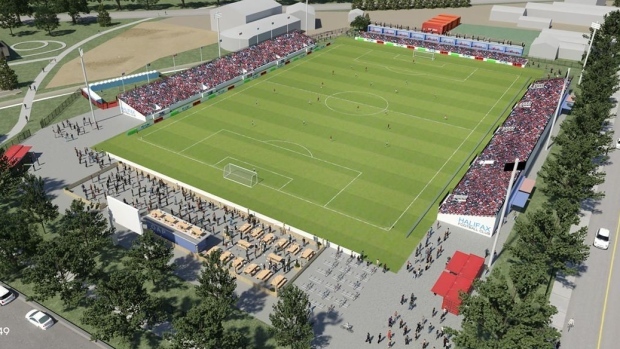 Halifax is a step closer to capturing a coveted new FIFA-sanctioned professional soccer franchise after city councillors unanimously signed off on a pop-up stadium at a downtown municipal sports field Tuesday. Sports Entertainment Atlantic pitched the temporary soccer facility in a bid to earn a team in the Canadian Premier League. "We're that much closer to being awarded a franchise," Sports Entertainment Atlantic president Derek Martin said. "The league was waiting to see how things would work here for us in Halifax. We had a lot of the details worked out but we just had no where to play." The team's home field would be at the Wanderers Grounds, a four-hectare natural turf sports field on the Halifax Commons. The Halifax Football Club, a possible name for the team, would have a 7,000 seat stadium and host 10 regular season games during the league's first season in 2018. Although councillors spoke in favour of bringing a professional soccer team to the city, some residents voiced concerns about the soccer stadium. A group called the Friends of Halifax Common said the private, for-profit company would interfere with public access to the site. Waye Mason, councillor for downtown Halifax, proposed several amendments to Tuesday's motion and clarified that Halifax retained ownership and control of the field. "We are mitigating and minimizing the impact," he said, noting that the visual impact of the stands will be addressed through scale and appearance and will be removed at the end of the season, the number of events will be restricted and must be finished by 11 p.m., and that the site is promptly cleaned up after games. "There will be an annual review and if there are problems, if there are drunken football hooligans running the streets of Summer street and Bell Road the deal is off," Mason told council. "But I don't think that is going to happen. I'm quite confident this is going to be a strong, positive addition to my neighbourhood and I'm looking forward to walking down and seeing how it all turns out." Martin called the amendments reasonable and said he looks forward to fine-tuning the agreement with staff. Halifax will enter into a three-year rental agreement at market value with Sports Entertainment Atlantic, which would give the company preferential bookings for the soccer league. The city will maintain full control over the booking of the Wanderers Grounds for other groups. The fledgling professional soccer league has awarded franchises to Hamilton and Winnipeg and is expected to have six to eight teams confirmed before the first season kicks off next year. James Covey, a soccer fan and part of the grassroots Halifax Wanderers Supporters Group vying to bring a pro-soccer team to the city, waited for hours to hear council's decision. "I'm very, very happy," he said. "We're going to have natural grass pitch. Honestly we're going to be the envy of the Canadian Premier league with that." Major League Soccer, a men's professional soccer league sanctioned by U.S. Soccer with teams in Toronto, Montreal and Vancouver, has made it clear it won't be expanding to another Canadian city, Covey said. "Halifax is the perfect size to attract smaller crowds of 5,000 to 6,000 people. I'm very confident we'll attract the crowds," he said. "The big European leagues are available on television for people to watch in a way they weren't just a few years ago and that means there is a younger generation coming along that is intimately familiar with the biggest stars of the game." Covey suggested the team could be named the Halifax Wanderers Football Club. Martin said the Wanderers name will work its name into "whatever we do." Note to readers: This is a corrected story. A previous version had an incorrect first name of a Halifax city councillor.